Over the next few years, much of Haiti will be rebuilt and much of its economy restructured. In response to last year’s earthquake an unprecedented amount of money has been promised for reconstruction. It’s more important than ever before that Haiti be governed by an administration that reflects the true will and interests of its people, rather than the concerns of foreign governments and corporations. In 2004, the US, France and Canada, in alliance with members of Haiti’s business community and demobilised soldiers of the Haitian army,overthrew the last Haitian government to enjoy genuine popular support: the party that led this government, Fanmi Lavalas, was elected with around 75% of the vote. This past November, these same powers imposed and funded an illegitimate electoral process in Haiti, one that blocked the participation of Fanmi Lavalas. 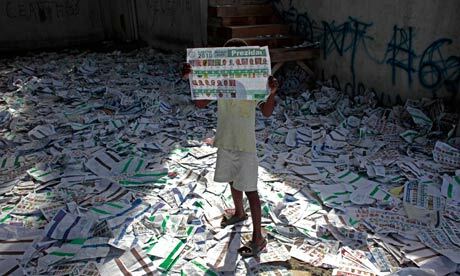 Only 23% of Haitian voters participated, scarcely a third of the proportion who voted in the last presidential election. In recent weeks, the US and its proxies have brazenly interfered in the interpretation of this election’s first round of results. The flawed November vote was not only inconclusive and unrepresentative, its outcome was also unlawful. If the second round of these elections goes ahead as planned on 20 March, it is now sure to result in the unconstitutional selection of a president with closer ties to the powers that sponsored and manipulated them than to the people meant to participate in them. At the same time, the powers that dominate Haiti have facilitated the return of the former dictator Jean-Claude Duvalier while discouraging the return of the twice-elected president (and Fanmi Lavalas leader) Jean-Bertrand Aristide. These powers, with their allies in the Haitian business community, have made it clear that they seek to delay Aristide’s return until after 20 March. They will only allow Aristide to return after a suitably pliant new government has been installed, to preside over the imminent reconstruction process. We the undersigned call on the Haitian government to make the security arrangements that will enable Aristide’s immediate return, and we call on the international community to support rather than undermine these efforts. We call on the Haitian government to cancel the second-round vote scheduled for 20 March and to organise a new round of elections, without exclusions or interference, to take place as soon as possible. (anarkismo.net) Haiti’s new president is a friend of coup-plotters, fascists, and armed right-wing groups in his country and abroad.